One of the modifications I was looking forward to seeing when Mike Hingley visited in March 2005 was the Range Rover handbrake lever fitted to his 110. The standard Defender handbrake can restrict leg room and be awkward to use, but with no centre seat to worry about the new lever fits snugly between the drivers seat and cubby box. 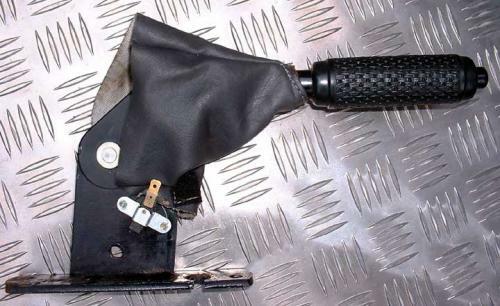 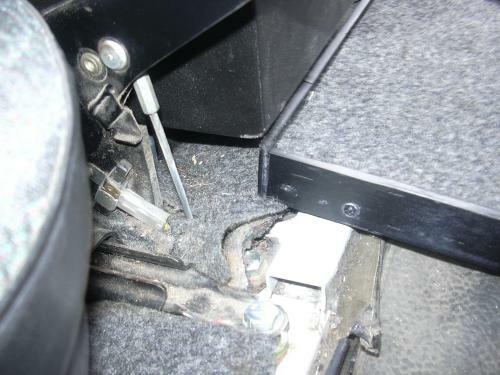 Before I actually got to fit my Range Rover handbrake lever, Neil Marshall posted a write-up in the LRE Defender Forum showing how he carried out the conversion. 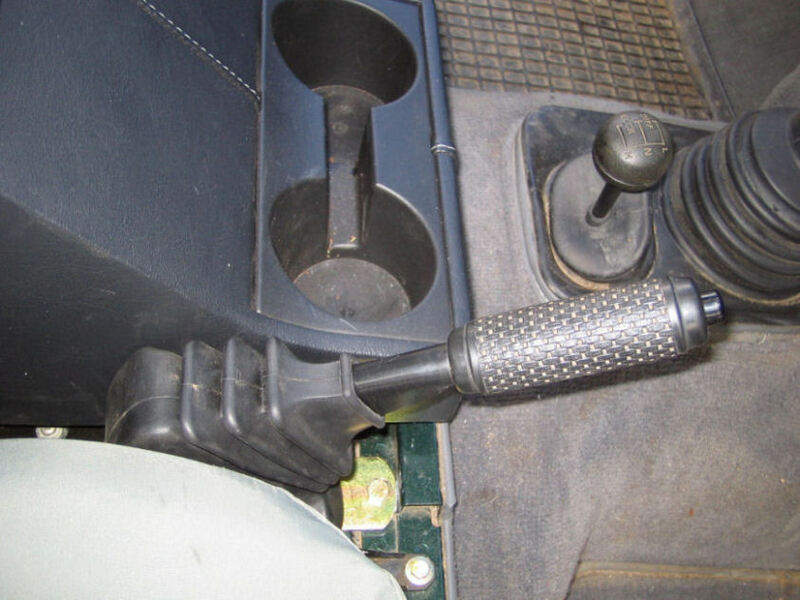 Not wanting to reinvent the wheel, I’d like to thank Neil for permission to reproduce his text and also the great photographs. 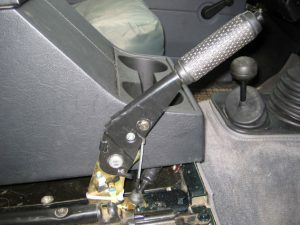 Not the first to do this, but having been irritated by the constant knocking of my left ankle against the handbrake on my 300 TDi, I swapped the Defender item for a Range Rover handbrake [off a LSE]. 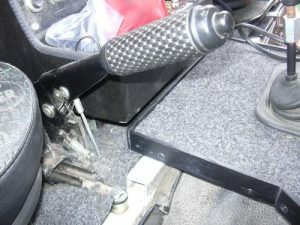 The job takes a couple of hours to complete but is really very simple. 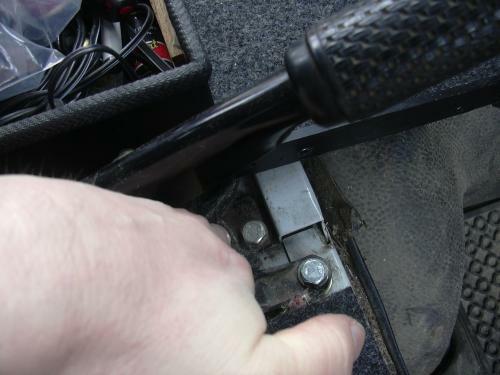 I removed my centre seat, having bought a new take off cubby box at Billing at the weekend, and used the front right seat fixing to securely mount the front bolt hole. 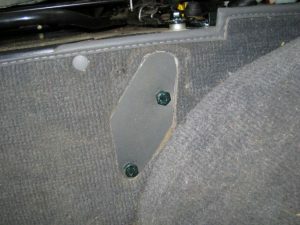 The RR base plate has two fixings plus an angled tube to locate the cable end, so two holes to be cut out of the seat box. 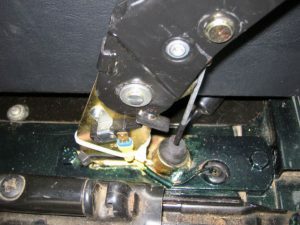 I drilled a further hole through the base plate and seat box [towards the front] to locate the grommet through which the switch lead passes. The darker [lower] area of the brake cable represents the amount adjusted/extended to reach the mounting pin on the RR handbrake, as explained in the next step. 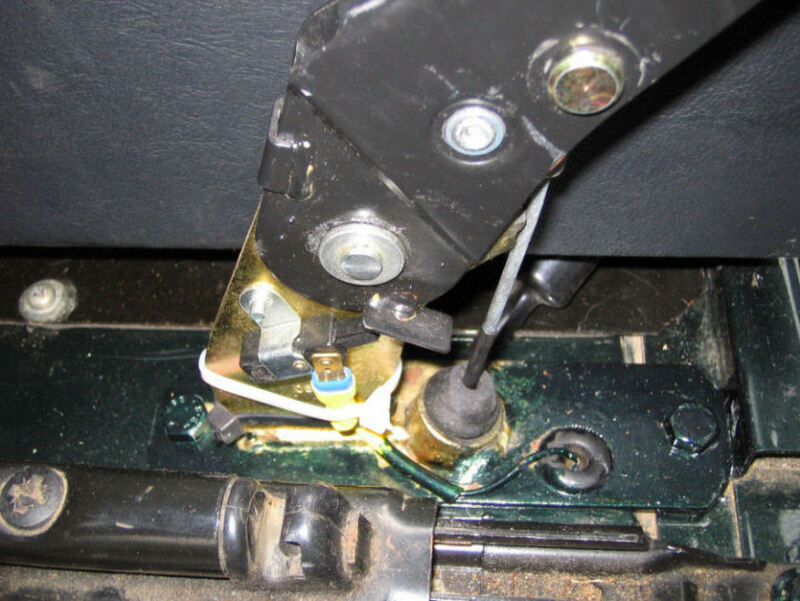 I found the cable length from the eye [that attaches to the handle] to the clamp too short and worried about having to fit a new cable…. in fact, the defender has an adjustment of about 2cm at the clamp end [two nuts] and I used the adjuster on the transmission brake [an external nut] to properly fit the cable. You can clearly see how the business end of the Defender brake cable, which is a double nut around a rubber sleeve, neatly sits inside the sleeve on the RR baseplate – it means that the hole cut in the top of the seatbox is not a critical measurement. 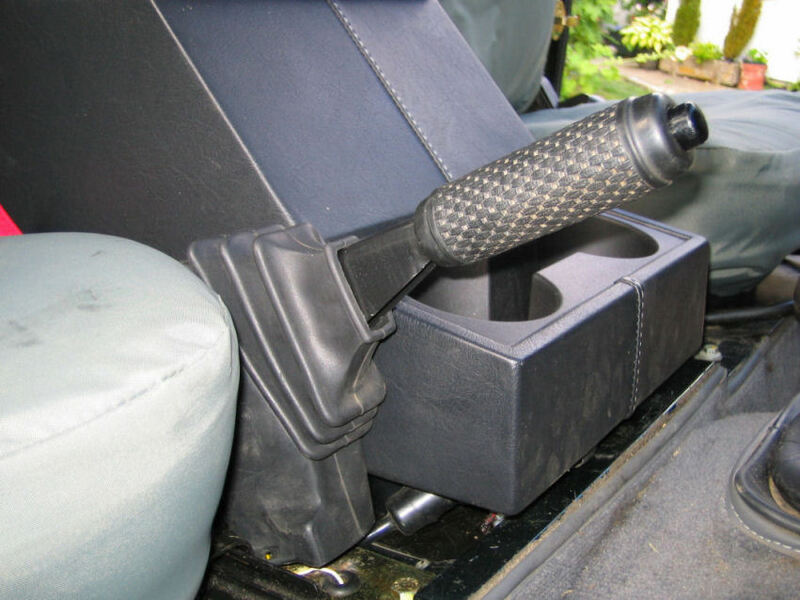 The rubber gaiter from the Defender brake fits nicely over the RR item and gives a more rugged appearance. 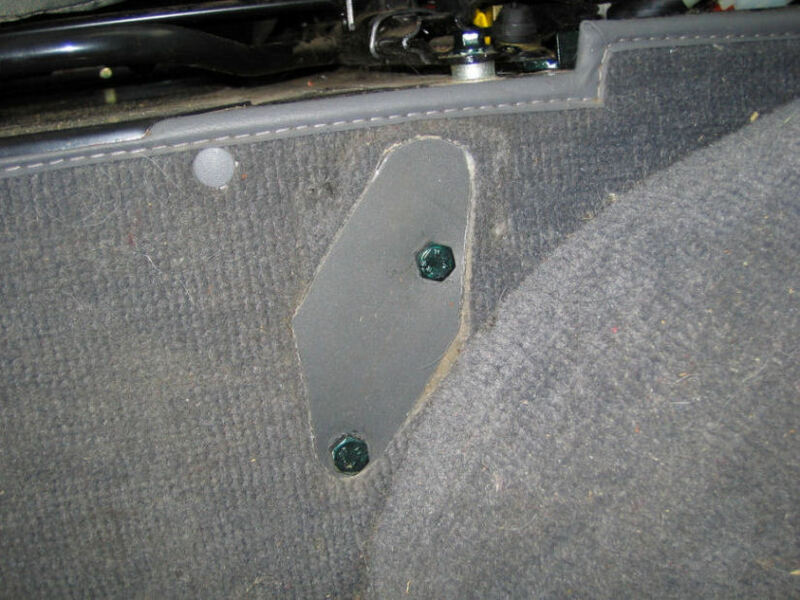 I blanked off the original location with a piece of 5mm Volvo plastic trim cut to match. 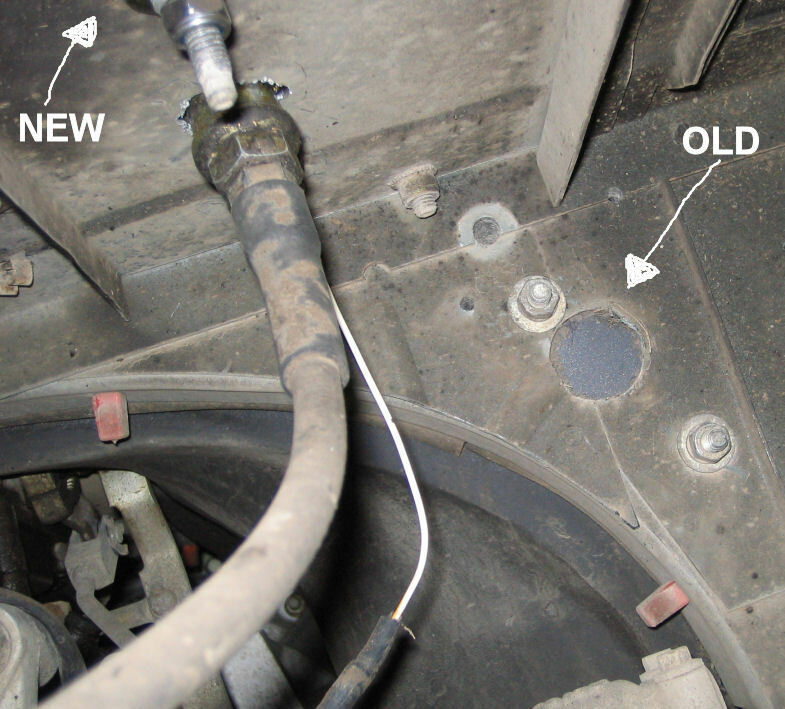 The rear has been sealed with a silicone mastic. 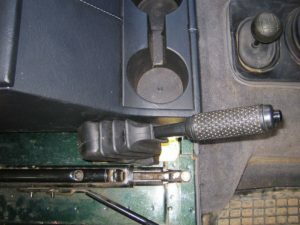 Having dismantled the Defender handbrake I have to say that it’s a fantastically strong bit of kit and more robust than the RR item. … however, the RR handbrake is strong enough and frankly looks like it should have been fitted to all cubby box equipped Defenders. 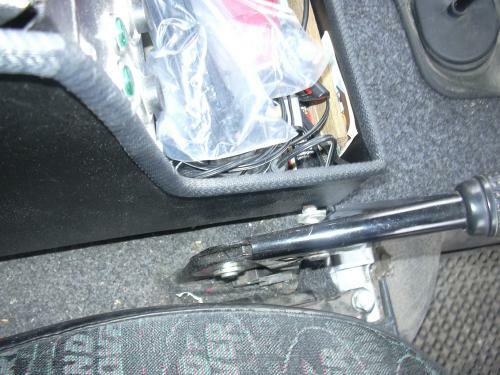 Some pictures of Mike Hingley’s Range Rover handbrake installation.